GREENVILLE, South Carolina (WTVD) -- Grayson Allen has embraced his role as Duke's sixth man during the past three weeks. "It's just to give the team that extra boost," he said. "And score points," Blue Devils coach Mike Krzyzewski interjected. Duke's Luke Kennard looks to dish to Amile Jefferson against Troy on Friday. 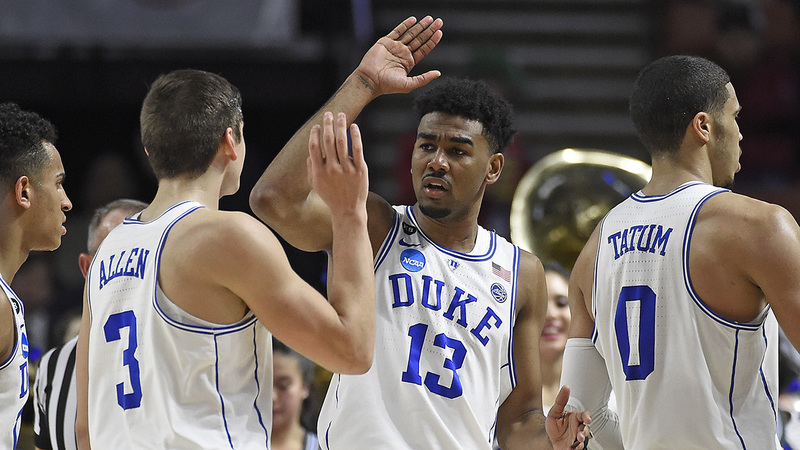 Allen did both to keep second-seeded Duke's postseason perfect in an 87-65 victory over Troy in the NCAA Tournament on Friday night to start the East Region. Allen had 21 points off five of Duke's 13 3-pointers and Jayson Tatum added 18 points and 12 rebounds. "I'm coming in with fresh legs off the bench," Allen said. "I'm coming in to explode really." Shrugging off the chorus of bad-boy boos each time he touched the ball, Allen helped the Blue Devils (29-7) improve to 34-7 all-time in opening NCAA games. On Sunday, they'll face No. 7 seed South Carolina, which beat No. 10 seed Marquette, 93-73. Jordon Varnado had 18 points to lead Troy, which made its first NCAA appearance since 2003. Varnado said the players came out sluggish and could not fight their way out of it. "We've got to use this motivation and fire we had before the game to come back hard" next year, the sophomore said. Duke, which averaged eight 3-pointers a game this season, hit 10 in the opening half to quickly pull away from the Trojans. Tatum opened the game with a 3. A short time later, Frank Jackson, Luke Kennard and Matt Jones had long-range baskets on consecutive possessions as the Blue Devils jumped to a 16-4 lead less than 5 minutes in. The lead shrunk to nine points in the second half, the final time at 59-50 on Wesley Person Jr.'s basket with 14:32 to go. But Jones and Allen followed with 3s and the Trojans (22-15) could not rally. Duke finished with 13 3-pointers, its highest total in nine games since hitting the same amount in a win over Wake Forest on Feb. 18. Jones finished with 14 points off three 3-pointers and Jackson 12 with two 3s. The Blue Devils' outside touch offset the poor performance of leading scorer Kennard, who was just 3-of-12 shooting for eight points - snapping a streak of 19 games scoring in double figures. If the Trojans were to challenge, they had to be on target from the outside. Instead, Troy went 5 of 23 from behind the arc. If you are looking for a soft spot in this one for the Blue Devils, it was at the foul line where they went 16 of 23 (under 70 percent) and missed back-to-back 1-and-1 attempts in the second half. Amile Jefferson played in his 149th game at Duke, the most in program history. Jefferson, a senior, shrugged it off: "It means I've been around a long time," he said. Krzyzewski praised Tatum, his 6-foot-8 freshman, for his defensive effort. Tatum had nine defensive rebounds along with four blocks and four steals against the Trojans. Krzyzewski also knew exactly who to blame for the court at Bon Secours Wellness Arena needing a quick repair right before the Blue Devils took the court - the media. "One of you probably dropped a camera or something," he joked.